Today the Church honors the Holy Name of the Blessed Virgin Mary, recalling also her patronage of Christians as (through the intercession of the same Mother of God) the Turks’ siege against Vienna was lifted on this day by the glorious victory of John III Sobieski in the year 1683. There is a great and consoling mystery hidden for us in the name “Mary”. It is possible that the name “Mary” is of Egyptian origin, for the first known instance of the name among the Chosen People is with the sister of Moses, Miriam. Now, as “Moses” and “Aaron” are almost certainly Egyptian names, there is some possibility that “Mary”/“Miriam” could be of Egyptian origin as well. The most likely Egyptian derivation would come from the word Mery/Meryt which means “cherished” or “beloved”. It could also be that the Egyptian mer or mar (“to love”) has been combined with the Hebrew Ya (YHWH) to mean, “one loving the Lord” or “one loved by the Lord”. Certainly, all this stands good theologically, but we must admit that the experts tell us that there are considerable etymological difficulties with recourse to Egyptian roots. Hence, it will be better to look instead to the many possible Hebrew explanations of the name. It is possible that the name of “Mary” is a composition of a Hebrew noun with either a suffix or an adjective, or even of two nouns. The Hebrew of “Mary” is miryam which could be meri with am, meaning “their rebellion” – and this may well be the sense of “Miriam” as applied to Moses’ sister, who rebelled against him in the desert. However, this meaning obviously cannot be applied to our Blessed Mother. It is also possible that miryam comes from mor and yam, meaning “myrrh of the sea”; or mari and yam, meaning “mistress of the sea”. Also interesting to note is the etymology whereby miryam is the combination of mar and yam, meaning “drop of the sea”. In Latin “drop of the sea” is translated as Stilla Maris. However, it seems that stilla was mistaken for stella – which means “star”. Hence, the extremely popular Ave Maris Stella (“Hail Star of the Sea”), whereby the faithful piously invoke our Blessed Lady as the sure guide through the stormy waters of this life to the glory and peace of life everlasting. While we admit that there is little etymological support for rendering miryam (“Mary”) as “Star of the Sea”, we do point out that the name could well mean “Lady of the Sea” who guides her children through the sea of this world – in this respect, the essence of the popular piety is well founded. If, on the other hand, the name miryam is taken to have come from a single Hebrew word, then it is quite possible that it means either “fat one” (from mara) or “lady” (from mari). Let us consider the meaning of these two etymologies. It may at first seem very strange to think that the name “Mary” would have anything to do with being “fat” or “plump”. However, we must remember that, in ancient Israel, to be “plump” was largely synonymous with being beautiful – indeed, it would have been quite a compliment to be call mara (“fat”) in first century Israel. Hence, we might well translate “Mary” as “beautiful one”, since this is the essential meaning of the word mara as applied to a woman. How beautiful indeed is our Blessed Mother! Likewise, it is no surprise to the believer that miryam could well come from the word mari (“mistress”) or marah (“ruling one”) and so mean “Lady”. When we speak of “Mary”, we are truly speaking of “Our Lady”! Oh Glorious and Immaculate Virgin Mary, Pray for us! Dear Father. Islam counts the day of defeat as Sept 11. 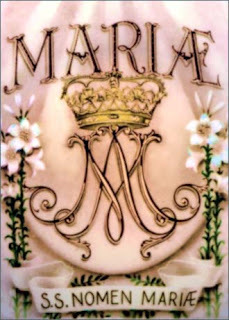 Thanks, Father, Happy Feast of the Most Holy Name of Mary! Say, is the date of this feast to specifically invoke Our Lady's patronage in lifting the siege of the Catholic Church by the radical Moslems in this time? As IAN Spartacus indicates, the 9/11 attack is meant by the radical Moslems to indicate that the fight to Rome is back on. The papacy, and thereby the Church, is to be destroyed and St. Peter's turned into a mosque. Is this feast an indication that we are responding as Catholic men with all the power and graces of Heaven, as mediated by Our Lady? Thank you, and God bless. Thank you, and happy feast of St. John Chrysostom. Thank you for your priesthood, and your prayers for the Church at the Altar. God bless you, Father.